In 1775 Ft. Trumbull was built in Milford. A Company of twenty men was assigned. They had three 9 pound and 1 twelve pound guns. In 1919 Milford's Broad St. Armory housed the 58 men of Battery E 242D Coast Artillery armed with a 3" M-4 Gun. In 1963 the CT Army National Guard took over the Nike Ajax Missile Site on Eells Hill Rd. and Rock Lane. The unit designation had a long history in Milford ...the 242D. In selecting sites for its missile batteries the Army faced a problem: it seemed the public was in favor of air defense as long as a missile battery was not deployed next door. To accommodate local concerns and cut land acquisition costs, the Army Corps of Engineers reduced the acreage needed by placing the missiles within underground magazines. Nike facilities were designed with habitability and outward appearance in mind. The one-story cinderblock sloped-roof structures looked much like many of the school buildings being erected in� communities. Shrubbery also enhanced facility appearance. Missile Site personnel, some 100 of them, added to the community consumer base and they became involved in community activities, such as Red Cross Blood Drives, Community parades� and serving as Color Guards for many events. Starting with the realignment of a Battery in the Los Angeles area on September 14, 1958, the National Guard Technicians responsibility grew to cover almost half and later all the Nike Missile Sites. A sense of community �ownership� of a local battery especially prevailed when the National Guard assumed responsibility of a Site. The assumption of Missile Batteries by the National Guard represented an unprecedented experiment; for the first time, a key component of the Nation�s Defense had been turned over to America�s Citizen Soldiers who manned the Batteries around the clock and departed annually to Ft. Bliss and McGregor Range for short notice annual missile firing practice (SNAP). Expertise was vitally important to the Nike Mission and to that end Guardsmen were sent to Ft. Bliss in an ongoing manner for schooling, some courses lasting as long as forty-eight weeks. �It must be noted that, because of the stability of personnel and the continuity of training and cross training ARNG troops achieved 11 of only 13 perfect scores recorded at McGregor Range. History of the Milford Nike Ajax Missile Site under Army Air Defense Command (ARADCOM). In 1955 the US Government began land purchases for a Nike Site on Eells Hill Road and Rock Lane in Milford, CT. By 1956 construction on the four acre sites began and 12' high fences were erected. �Sites were emplaced where the industrial and population density required maximum defense. "The Milford Battery Site to honor those citizens of Milford who served their country in defense of freedom." 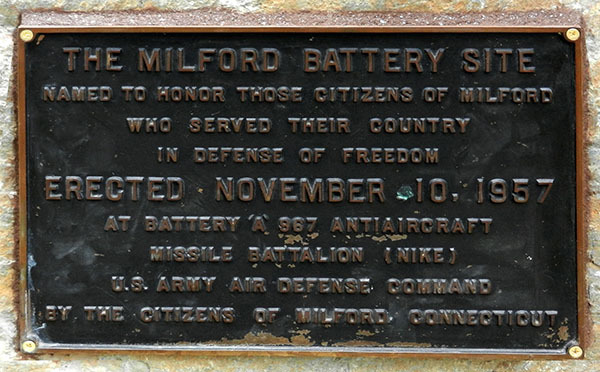 The plaque was emplaced on November 10, 1957 at Battery "A" 967th Anti Aircraft Missile Battalion (NIKE) U.S. Army Air Defense Command by the Citizens of Milford, Connecticut." Originally the Sites had a PX which were terminated when the National Guard took over. However, �the Barber shop, Day Room (pool and TV), Medics room which still had a first aid capability and a cross trained qualified medic� who dispensed Polio sugar cubes and gave injections as required, Supply Room, �Signal Room, Enlisted Men's Club (for off duty drinking and card games), and limitedly the Mess Hall, all buildings survive (2013). The Motor Pool was located in the LCA, because there was more parking space there and possibly, because that area had a lot of appropriate tools available. Many technicians qualified on a number� of different types of vehicles in inventory, so that there would not be delays due to a lack of qualified drivers. The site had Ordinance Equipment and Maintenance Support shop which was located conveniently on Seemans Lane in Milford. The US Army 967th participated in local parades and once an unarmed Nike Ajax Missile slid off its low-boy hauler ending in the gutter on Merwin Avenue near Riverdale Road. That event brought out crowds. The 48 full time Technicians also had to be enlisted in the CT National Guard but working in uniform under the Wage Board for the CT Military Department, United States Property & Fiscal Office. In October 1962 they were placed under the Army-Air Force Wage Board Schedule and soon worked under the DOD. These men were augmented by an almost equal number of National Guardsmen who performed Tuesday evening , often weekend, and annual two week training at the Site. In the event of a National Emergency they would be called up and then the Battery would be at full strength. �Most positions required security clearances, some, all the way up to Top Secret. In June 1960 the Battery was sent for annual weapons firing at a range in Wallingford to qualify with their 30 cal. carbines. Most became experts and sharpshooters. On July 31, 1960 the CT NG Technicians left Sikorsky Airport on a Hawaiian Airlines four engine plane which was so overloaded that when taxiing its wings were like the non flying Dodo bird. Upon arrival at El Paso Airport military buses brought the men �to Ft. Bliss, TX, to C Battery 4th Guided Missile BN, on August 3 and they moved on to Mc Gregor Range, NM �for Troop & Package #18 training on the Nike Ajax system. After three months and graduation they returned to the Milford �Site on October 31 for further training and cross training and they assumed the Mission on January 5, 1961 when the 63rd Arty Group turned the �site over to the National Guard in Milford, Portland, Simsbury and Westport. The State of CT Adjutant General said of them:� These Guardsmen have become the modern Minutemen of the Missile age, these men with supersonic missiles will defend Connecticut's Cities and Towns. The soldier/technicians of A Battery were willing participants in many local Red Cross Blood Drives, some being 3 and 4 gallon donors. The Red Cross returned the favor during a severe snow storm when technicians were unable to get support they came out in snowshoes to deliver food.� When it snowed getting to the site IFC was difficult, because of the steep climb to Eells Hill, on top of which the site was located. Going down was even worse, because braking in snow is never easy. At the bottom of the hill there was a stop sign and the crossroad was always busy and just a bit down that road was Dead Man's Curve since realigned. In 1961 the Battery established a Boy Scout �Troop & Post 19 at the Site with an initial Battery donation of $50. Its sponsorship led to a doubling in size to 25 members by 1962. To the delight of the boys the Scoutmaster and assistants were all Nike Men whom they emulated on Monday evening meetings. The boys particularly enjoyed being marched to cadence. The Bridgeport State Jail allowed Trustees �to cut grass, paint and perform other work at the Site. Daily two guards armed with shotguns �took custody of prisoners and brought them to the site with a military station wagon. �An escape attempt and an unauthorized stop brought the program to an end. Army concern about readiness brought Operational Readiness Evaluation (ORE) teams in frequently, often by chopper. For this and by reason of the mission Nike Men had to provide lists of contact telephone numbers so that they could always be reached. ORE�s were a necessity though viewed as a common nuisance by Site personnel. The ORE team would arrive and announce "Blazing Skies, Simulate Case 3", and if the unit could not achieve a "ready for action status" within the prescribed stopwatch time all other units would have to come up a notch, and that did not sit well for those who had to come to "hot battery" in lieu of the unit going out of action (O/A). Reveille and Retreat on the Site�s were daily occurrences to the tune of a scratchy bugle recording similar to that of Radar O'Rielly (MASH). Everyone kept close track of their watches so that they would not be caught outside at the appointed times, which required standing at attention and saluting for the duration of the recording. Those in automobiles also had to dismount and salute the flag. Sometimes the flag would get wrapped up and could not be lowered. The Milford Fire Department would send up a truck, but for some reason of legality could not send a Fireman up to retrieve it. A technician volunteered and they shot him up with the ladder. In June 1962 "A" Battery sent that man to the New Haven Fire College for training, the only man ever sent. Upon graduation he became the unit Fire Marshal and began to give Fire & Safety classes. On June 10 that year the unit was sent to SNAP at Ft. Bliss TX and McGregor Range NM. On 15 October 1962 the "Cuban Missile Crisis" gripped the Nation and the Site was placed on full alert, to Battle Stations, which was a first. All Battle Stations were manned 24 hours a day during the two week crisis which ended on 28 October. In January 1963 the Battery sent a technician to Ft. McClellan, AL for training in Chemical, Biological & Radiological Warfare. Upon graduation and return to his unit he became the Battalion CBR instructor. 1963 A belated and only stag party at the Site was held for a technician in the Mess Hall. In March the Site was deactivated and the troops sent to Ansonia to begin training on the somewhat similar Nike Hercules equipment. In September they qualified to take over after receiving a passing score at McGregor Range, NM. In 2009 a memorial to Nike men, which includes a Nike Ajax Missile, was dedicated at Camp Niantic, CT. "Nike Missilemen of the CT Army National Guard whose expertise and devotion to duty was a shield of faith under those uncertain times." 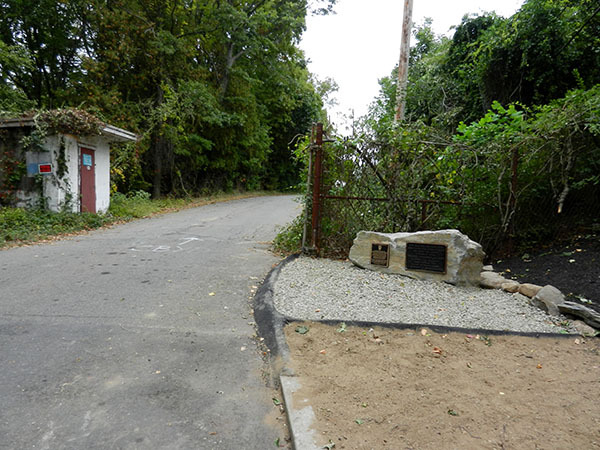 At the Milford Site's closing in 1963 the dedication plaque was removed and retained by a Warrant Officer who 39 years later brought it to a Nike reunion in Niantic yielding it to another unauthorized custodian in 2002. Finally in 2013 Eric Muth tracked it down and it was returned to the City of Milford. 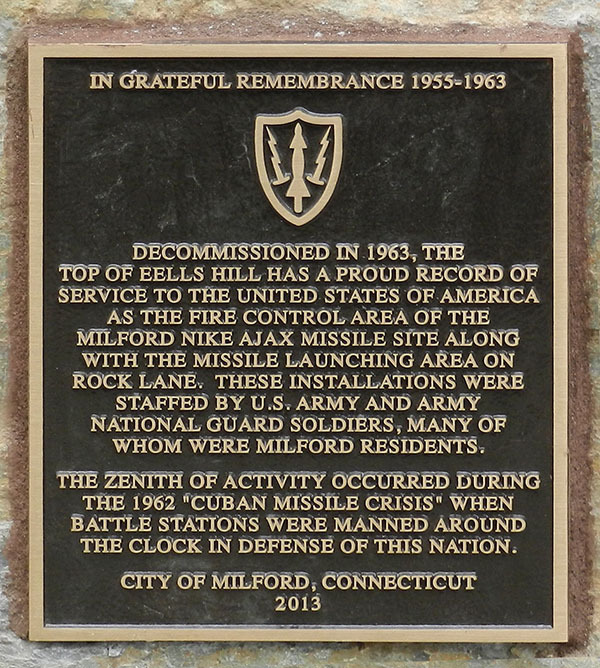 Decommissioned in 1963, the top of EELLS HILL has a proud record of service to the United States of America as the Fire Control area of the Milford Nike Ajax Missile Site along with the Missile Launching area on Rock Lane. These installations were staffed by U.S. Army and Army National Guard Soldiers, many of whom were Milford residents. The zenith of activity occurred during the 1962 "Cuban Missile Crisis" when Battle Stations were manned around the clock in Defense of this Nation. City of Milford, Connecticut, 2013.